I remember following my Uncle Joe through the reeds that towered above me as we crossed the swamp that gurgled below the thickly jungled hill from where my grandmother lived on the island of Guam. I was barely 7 years old. The stench of the dark muddy water clinged to my legs and sneakers and shorts. The mud felt like quicksand as the occasional freshwater eel would brush against my legs as we would passed through schools of them slithering by. We were going to the embankment on the other side . My uncle was on a boar hunt. He took me to assist him and as a rite of passage . I was the oldest son in my family and such things were what men do. All I could think of was how stinky the swamp made me smell. We finally made it to the other side and got up on dry ground. 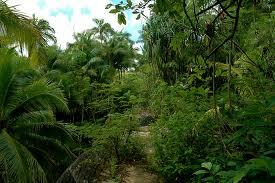 Then we entered the jungle as the hot air was steamed by the tropical humidity. Uncle Joe turned into a warrior focused on finding his prey. He transformed into this focused machine hunting entity. He tracked and read signs in the environment very, very carefully. I followed him. Soon he heard something. I flashed around to the direction he was looking at and there was this very large boar through some jungle brush. My uncle told me to stand quiet and like some stealth warrior he went into action and moved quickly. He took position and with his rifle took a couple of shots . The boar went down quickly with a couple of squeals. We went over to it. There was blood where my Uncle shot it. The animal was huge. My Uncle even was surprised when we got up close to it. I immediately turned around and went back through the path through the jungle. Every imagining from every scary story or movie, I had read or seen came to mind. Every shadow came alive in the jungle. I saw claws and elongated monstrous fingers reaching out to me. I imagined wicked laughter ringing through the air. As I crossed the swamp, it felt like it was never ending and that the eels where now monstrous sea creatures ready to devour me up. I expected the undead to rise up and grabbed me. Despite the sticky, muddy bottom I ran through the swamp. When I made shore, I rushed through the jungle on that side, trying to keep away thoughts of ghouls and demons ready to murder me. Then I found myself outside of the jungle with my grandmother’s house in view. I ran there. My grandmother and one of my uncles was at the house. Of course, grandma was worried that I had been sent by myself alone back to fetch them, but soon relented when I told my story. A few other men were gathered up. Despite my grandmother’s protest, I was asked to accompany the men back to help assist them in locating my uncle. I was not scared at all this time. The boar was brought back and ended up being the main course of several relatives’ dinners in that area. Uncle Joe was glad and proud of me that day. I felt like I overcame some fears. Plus, Grandma made me some of her homemade doughnuts. That was worth it. Great story–meaningful and memorable. The slough path where I often walk also smells nasty at the muddy end of it. I can’t imagine walking into the mud. I like all the relationships reflected in your story, with others and yourself. thanks for finding my blog, I look forward to reading more of your poetry and reflections. Thank you, Tobeamazed for your kind words. I look forward to also keeping in touch with your posts. Hey there. Thanks for the ping-back. Great boyhood memory you shared here.